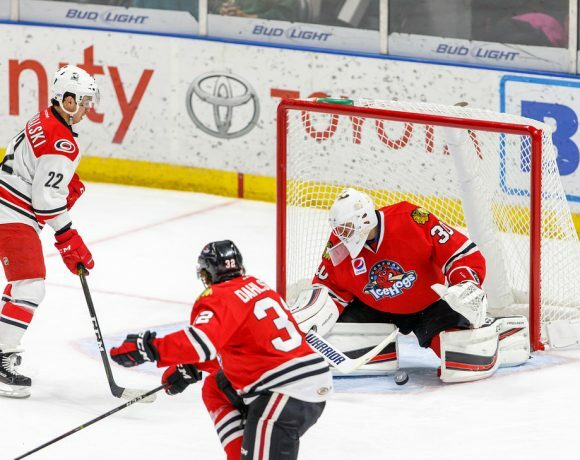 The Rockford IceHogs are coming off three straight losses to a Milwaukee club that was teetering on the edge of the playoff hunt. As a result, the Hogs can take a simple approach to their final eight games of the regular season. Adrian Balboa I’m not, but Rockford would do well to follow that edict. The IceHogs host the top two teams in the Central Division this weekend in Grand Rapids and Chicago. That tall order is followed up by crucial tilts involving two of the three teams currently scrapping with Rockford for the division’s final playoff spot. The Hogs fared a bit better in Wednesday’s game with the Admirals, though Milwaukee still posted a 4-2 victory. Chad Krys had a solid pro debut for the piglets, creating a scoring opportunity after picking off an Ads clearing attempt and sending a nice drop pass to Anthony Louis in the third period. Louis’s goal tied the score at two, though the Admirals would prevail. 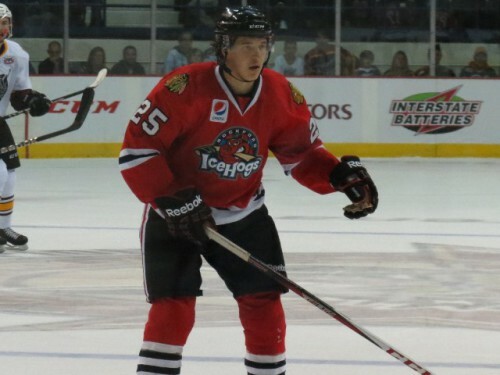 Along with Krys, Rockford also saw Jacob Nilsson and Nick Moutrey return to action. That’s encouraging heading into two must-win contests with the cream of the division coming to the BMO Harris Bank Center. Rockford needs at least a split against the Griffins Saturday night and Wolves Sunday afternoon to keep up with the neighbors. It’s nearly a dead heat for fourth place. Texas and Milwaukee each have 73 points, with the Hogs and Manitoba each boasting 72. The Moose and Admirals share a .537 points percentage compared to the Stars and Rockford, who both are at the .529 mark. The IceHogs have a decent measure of control as far as reaching the postseason. Rockford has two games remaining against Texas and Milwaukee before the regular season ends. The Stars finish their schedule with three games against last-place San Antonio. Before that, they visit Iowa this weekend for a pair and host the IceHogs for a back-to-back next weekend. Manitoba has four of its last nine games against the Rampage (two games) and Pacific cellar-dwellers Stockton (two games). On the other hand, the other five are with Bakersfield (two), Grand Rapids and Chicago (two), the best three teams in the Western Conference. Aside from their two games remaining with the Hogs, Milwaukee has two games left with the Wolves, a pair with Grand Rapids and one each with Iowa and San Antonio. Five of the Admirals last eight games are at home, while each of the other three teams have four home dates left. Rockford closes the season with four straight road contests (two in Texas, Milwaukee and Iowa) before the regular season finale against the Ads April 14. That game could well decide the fate of the Hogs, provided Rockford doesn’t continue to wobble down the stretch. 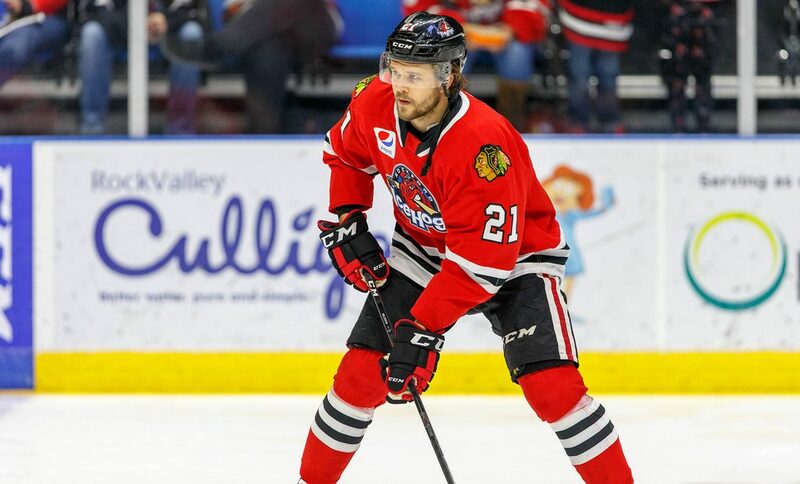 Krys, who signed his entry contract with the Blackhawks last week, signed a PTO with the IceHogs on Monday. He’ll probably be a mainstay in the lineup until the season concludes. On Wednesday, Rockford sent defenseman Josh McArdle to the Indy Fuel of the ECHL, along with forward Spencer Watson. Defenseman Dmitri Osipov was released from his PTO the same day. You could speculate that either of the veteran blueliners, Andrew Campbell and Brandon Davidson, are ready to skate this weekend. Otherwise, Rockford just has six defensemen available. Dennis Gilbert left the ice after a big hit Wednesday but returned to action shortly thereafter. Forwards Terry Broadhust and Matthew Highmore are nearing returns but probably won’t be on the ice this weekend. Luke Johnson did not skate on Wednesday, missing his second straight game after an injury last Friday in Milwaukee. Follow me @JonFromi for updates on this weekend’s action as well as thoughts on the IceHogs throughout the rest of the 2018-19 campaign.